In football, as in society, mobility helps. When, on 8 September 1888, Burnley kicked off their inaugural Football League campaign at Deepdale, they were participating in what was essentially a Northern/Midlands cartel. Even with extensions in 1892 and 1921, which made the competition genuinely nationwide, the Football League remained a closed shop. Although the four teams that propped up the fourth tier had to apply for re-election, this was usually a formality. A club was more likely to go bankrupt than it was to be voted out of the Football League. All that changed in 1987. The non-League world – previously a picturesque patchwork of regional and county leagues – had consolidated in 1979 into a more competitive pyramid, at the top of which stood the Alliance Premier League, later the Conference, a nationwide League of semi-professional sides. The direction of travel was obvious: promote the Alliance League champions into the Football League. Not surprisingly, the Football League took some time to come round to the idea. The first eight Alliance Premier League champions were all denied entry to the Football League through the election system, including a highly competitive Altrincham outfit that routinely dumped professional sides out of the FA Cup. Indeed, the competitive FA Cup fixtures between League and non-League provided the best evidence for reform. Embarrassingly, Burnley provided a case study for the prosecution when, in the First Round of the 1986/87 competition, they went to Telford United and were walloped 3-0, perhaps the lowest point of Burnley’s post-war history. It was at precisely this point in time, with the Clarets at a subterranean ebb, that the non-League powers-that-be had finally won the argument with their Football League superiors. With the likes of Crewe, Rochdale, Hartlepool and Halifax perennially struggling at the wrong end of the Fourth Division and barely justifying their League status, it was agreed that the team that finished bottom of the Football League in May 1987 would be the first to be automatically relegated, banished from the brotherhood, to be replaced by the champions of non-League. It was clearly a progressive move, designed to drive up standards, reward aspirational semi-pro clubs and deliver a steel-toed boot up the backside to complacent Football League basement-dwellers. What hardly anyone contemplated was that the newly-installed elephant trap would not just ensnare a historically significant club, a big beast, but potentially finish it off. Was this a price worth paying for meritocratic mobility in English football? 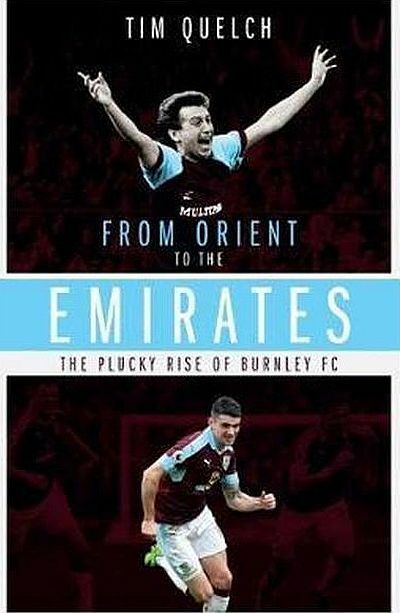 How this state of affairs came to be is the opening, scene-setting chapter of Tim Quelch’s From Orient to the Emirates, a 30-year history of Burnley Football Club from the hysteria of that final game of the 1986/87 season to the current day, and I honestly can’t think of anyone better qualified for the task than Tim. Regular readers of these pages down the years have delighted in his ‘Rock and Roll Diaries’, August-to-May accounts of past campaigns in which vivid match reportage is liberally peppered with contextual references to music, politics and social change. These diaries were collected in the Forever and Ever volume, published to commemorate the promotion in 2000. However, From Orient to the Emirates is a different beast. Tim’s writing is as elegant as ever, and the careful calibration of argument and evidence that he brings to bear on some of the most keenly contested questions of the period is just as we have come to expect and is precisely what such a turbulent history needs in the telling. But this is overwhelmingly a football book, with a forensic focus on Burnley Football Club: its players, managers, directors and supporters, how they responded to events and fought to shape the future of the sporting institution they all cherished but had different visions for. In putting this history together, Tim has drawn on a wide range of published sources, including, I’m pleased to say, the London Clarets magazine. But there are also some primary sources tracked down by Tim and interviewed specifically for the book. Clive Holt is one such source, on the board at Turf Moor since the lost years of the mid-1980s, and better placed than anyone to give the longer historical view from an insider’s perspective. Barry Kilby, the chairman who finally got the club back and established in the top half of English League football, is another who has granted Tim an extensive interview. The brutally honest, private diaries of Derek Gill, a key figure behind the scenes in the 1980s, are also given a rare public ventilation. The book has a chronological structure, and hence begins with a testing question: is a football club defined by the economic circumstances of its surroundings? Even in the pre-Sky days when, in the absence of a rich chairman, a club had to live entirely off its own revenues, the answer was: not necessarily. But to go against the grain – to flourish when all around you were starved of investment and hope – was a difficult feat to pull off, let alone maintain. This is the conventional story of the 1970s and 1980s at Turf Moor: a brilliantly innovative club whose eventual decline reflected an economic reality it had done well to defy for so long. But in Tim’s account of these times, there are indications of an alternative narrative. For while other deindustrialising Northern towns suffered alongside Burnley, few of their football clubs fell as rapidly or as near-terminally. Tim offers a clue when he reveals that Bob Lord sold his controlling stake for just £52,000, with the club’s new finance director subsequently discovering the club’s accounts in a shambolic state. In other words, the club had rotted from the top down, presided over by a man born in the Edwardian era, shaped by the harshness of the Great Depression, and fuelled by a bullish self-confidence. For sure, Burnley was suffering economically, but there was still money in East Lancashire, an area that has always produced its fair share of astute entrepreneurs and far-sighted businessmen. Lord had been ahead of the game once, buying Gawthorpe for the club out of his own money as a base for a scouting and coaching system that established Burnley as the best finishing school for young talent in the country. But long before he died, Lord had outlived his usefulness to the club. What might have happened had he been prepared to step down and allow for fresh investment? What might that terrific Jimmy Adamson team of 1972/73 have achieved in the game if it had been astutely developed and built upon rather than dismantled piece by piece? The Bond year – a thoroughly-dissected twelve months of the club’s history – is also part of the contextual background to the main story, but what Tim really brings out here is how quickly Bond’s arrival changes the club. From the comments Tim has gleaned from those behind the scenes, for all the bombastic self-assurance of new chairman John Jackson, they are actually diminished figures in the presence of Bond. His every wish is their command. There is an unmistakable air of disbelief when Gill contemplates what the board sanctioned for Bond, and a keen sense of retrospective regret at how badly they had mismanaged a man who had been considered one of the top coaches in the country. The Bond year is important because it effectively cleans the club out money-wise while severely undermining the trust between terrace and boardroom that had recovered a little in the immediate post-Lord period. Just when the club, with its Gawthorpe conveyer belt rusted beyond use, became entirely reliant on the supporters to generate revenue, the supporters were never less inclined to turn up. The one figure who sensed that things had to fundamentally change was Gill. He was an interesting individual with an incongruous mix of interests: a Labour Party man with a manufacturing company and a sober understanding of business finance; his hobby was music, but his real outside passion was Burnley FC; he knew how to turn a profit, but he also understood the necessity of investment. It was this last sensibility that marked him out from the others involved in Turf Moor boardroom politics at this time. Basil Dearing – a respected local solicitor – advised us that the club was trading illegally, and that the only solution was to seek administration. There was no way I was prepared to agree with this. We decided that a better way forward was to re-value Turf Moor. This enabled us to bring in further loans on the back of the improved collateral. This was the immediate context of the season that culminated in the Orient game: directors rejecting an investment offer and instead indulging in some accounting sophistry to extend the club’s indebtedness. Like you, I watched unbelievable mistakes being made and huge sums of money wasted – and like you I told myself it serves them right for the way they ran things. Now it may be too late. If this dilemma has proved anything, it is that the club needs the public more than they need it. We can do nothing except turn up at Turf Moor and yell the side on. If at 4.40pm a week tomorrow, Burnley is still a Football League side, doesn’t it make sense that we all get together with everyone concerned to make us all feel part of what was once the town’s greatest ambassador? The famous front cover image of From Orient to the Emirates of an ecstatic Ian Britton tells you all you need to know about the final outcome of the 1986/87 season, after which the club began to slowly recover. But the hopes of Jimmy Mac – that a more collegiate, community-oriented club would emerge from the trauma of 1987 – were to be dashed. The stentorian re-building efforts of manager Brian Miller that summer meant that we never again had to seriously contemplate relegation from the Football League, but it wasn’t too long before more tensions emerged around the fiscal approach of the club. It had been a collective board decision that we should attempt to sign Reeves, and yet Frank reversed this unilaterally. The thing about Frank Teasdale is that he was terrific at keeping the wolf from the door, but at heart he was a very cautious man. In his time in charge, I think we missed important opportunities to progress because he was too risk-averse. Brian Miller was a good judge of a player… but he probably wasn’t given enough resources to have put together a promotion-winning side. David Reeves would have made an important difference had we signed him permanently. This financial caution around Reeves would cost Brian Miller dear. Instead of signing a proven young talent (and someone who would go on to be a prolific lower league striker) he waited until the summer of 1988 to recruit Brendan O’Connell on a free transfer from Exeter. Just six months later, in January 1989, Miller called it a day as his misfiring Burnley side slid down the Fourth Division after topping the table early on and performing to enthusiastic Turf Moor crowds approaching 10,000. But as a manager, Casper remained an enigma at the Turf, and Tim does an excellent job in trying to figure out why this exceptionally talented coach under-achieved in the managerial chair. No one doubted his ability to set a side up or his understanding of the game, and it was also the case that by the time the 1991/92 season kicked off, he had put together the strongest Burnley squad since the early 1980s, paying some ludicrously tiny sums in the process: £30,000 for John Deary, £35,000 for Mike Conroy, £60,000 for Steve Davis II, £65,000 for Ron Futcher, £70,000 for John Pender and nothing at all for Roger Eli, Steve Harper and Joe Jakub. Only the £90,000 purchase of John Francis from Sheffield United could be described as remotely speculative. He was a top quality coach. He was the sort of boss you could talk to when you needed to, or share an opinion with. Some of the abuse he endured was downright vicious and cruel. Frank felt enormous pressure from success-starved fans. It got to us, too. In other words, Casper was more nuanced and sensitive than the exterior gruffness indicated. Harbouring a lingering bitterness at the way he had been robbed of the last and most lucrative years of his playing career, yet also appreciative of the family ethos that he had enjoyed at the Turf as a player, Casper did his best to shield his players from public criticism whilst also drilling them in a hard but educative manner at Gawthorpe. The recruitment of Jimmy Mullen as his assistant in the summer of 1990 seemed to make a difference to the 1990/91 side, which played with more aggression and attacking flair. But the very real expectation among the Turf Moor faithful that this, finally, was the team to take Burnley out of the basement division piled the pressure on Casper. As if to show how public perceptions can be very different to the reality, the outwardly affable Jimmy Mullen was not a popular figure in the dressing room, suspected by some players of doing so little to support Casper as to be blatantly after his job. The season’s infamous climax in the play-off defeat at Torquay must have nearly done for Casper, but he remained until his resignation was accepted in October 1991, and there are allusions in the book to Casper’s fears for his health if he remained in the post any longer. He had also been given pause for thought by the sudden death of his close friend Gordon Clayton, also a lifelong football man whom Casper had employed in a range of roles at Turf Moor, including chief scout. Casper’s resignation saw Mullen given the job on a temporary basis, but it didn’t take long for him to make the job his own. Sensing that the squad was at its strongest going forward, Mullen simply set them up to attack, and the results were instantaneous. Even so, some in the squad harboured doubts about Mullen and lamented that they had been unable to play this way and relieve some of the pressure on Casper. Chapter Five of From Orient to the Emirates is entitled ‘Jimmy Mullen’s Claret and Blue Army’ and is, of course, a nostalgic delight to read, encompassing the barnstorming divisional champions of 1992 and their gradual evolution into the promotion winners of 1994. Quite rightly, Tim chooses Andrew Firmin’s peerless account of the Play-Off Final to describe the drama of the occasion and of the match, especially the closing stages when the nine men of Stockport County somehow pinned us back and missed a number of opportunities to equalise. Unsurprisingly, the Wembley play-off victory of 1994 is the triumphant end of one chapter, for the story takes a more sombre turn thereafter. Tim’s account of the 1994/95 season reveals a manager caught out at the higher level, whose tactics did not add up to a coherent strategy. Another skill that deserted the club at this point is recruitment. Although the post-87 signings of Miller and Casper didn’t always work out (remember Tony Hancock? ), the number of bargains they did pick up suggested a shrewd, well-connected assessor of talent at work behind the scenes. The tragedy of the 1994/95 season is that, for once, the club had some money in the transfer kitty. To be fair to Teasdale, Burnley ended the campaign as one of the highest spenders in the division, but the more expensive players Mullen was now able to bring in rarely brought significant improvements to the squad and often did not address key weaknesses. By the end of the season, not only had the club spent around £1.3 million and been relegated, but the costlier new recruits often compared unfavourably to some of the crowd favourites who had been let go. The obvious retort – that they were playing at a higher level of football – did not stand the test of time as the same players continued to struggle in the lower division the following season. The 1995 relegation was a huge setback for the club, being a second failure, after the 82/83 season, to survive one year in the second tier after a hard-fought promotion. It seemed to suggest that the club’s future did indeed lie in the lower reaches of the Football League, a difficult, almost unpalatable prospect for many of the club’s supporters. It also ratcheted up the pressure on the board. Whilst chairman Teasdale was quick to point out the investment he had sanctioned in an effort to remain in the second tier, the uncomfortable fact was that it hadn’t been enough. Sure enough, the 1995/96 season quickly unravelled amidst falling gates and mid-match protests from those still turning up. Looking back, the poor recruitment post-Wembley had longer-term consequences, since the rest of the 1990s was, on the pitch at least, more or less lost. Off the field, the club’s brief second-tier status gave it the opportunity to apply for grant money available for ground redevelopment. Tim here generously allocates a few pages to Clive Holt’s description of this process. Holt does actually admit that the stands are “clinical and unadventurous” but argues that they represented the best value they could get for the approximately £5 million they cost to put up, half of which had to be met by the club. Mullen’s departure in February 1996 heralded a couple of experiments with much younger managers trying to make the leap from playing to managing without a coaching interregnum. Quite why the club went for this policy is unclear, because if the experience of Casper and Mullen was anything to go by, it wasn’t a job for the green and uninitiated. Both had accumulated years of experience as players, coaches and managers, and yet had succumbed to the pressure of the job. Neither would work in any major capacity in the game again. Both younger managers were judicious enough to bring along experienced assistants. Adrian Heath’s right-hand man was John Ward, who had learned the coaching trade under Graham Taylor at both Watford and Aston Villa. One welcome development under Heath was the bringing through of some home-grown younger players into the first team squad – indeed Tim’s narrative here brings out a sense of optimism that Heath might engineer a younger, more vibrant side. When Heath’s Burnley thumped league leaders Brentford 3-0 at Griffin Park in March 1997 to move within striking distance of the play-offs, there were real hopes that Heath and Ward might be brewing up something interesting. However, the team subsided quite dramatically, including an unexpected 5-0 humiliation at Wycombe, from which the only positive outcome was Andrew Firmin’s subsequent tragi-comic match report in these pages. Tim quotes Jamie Hoyland’s explanation that the good form under Heath was mainly due to Ward, “…a suberb coach who got us playing as well as we did that season. When he left…we lost our main tactician and organiser.” Heath scarpered back to Everton at the end of the season, paving the way for a certain Chris Waddle. Clive Holt tells Tim that Waddle was “top of our list from day one,” which suggests that Waddle’s availability was known in advance, but it would be interesting to know how much due diligence the Burnley board carried out on him. In Pete Davies’ superb account of the 1990 World Cup Finals, All Played Out, Waddle muses on a managerial career, telling Davies how wonderful it would be to resurrect one of the great names of the English game, like Burnley. It seems odd to peg Waddle as a football romantic, given his elite career, but there’s no question that he understood the traditions from which clubs like Burnley were founded. Like Heath, he appointed an experienced deputy in the shape of Glenn Roeder, and it is certainly true to say that the response from the town was highly enthusiastic. So was Waddle a brave gamble that just didn’t work out? Some maintain that it was, but Tim finds dissenting voices that question Waddle’s readiness for the role and his commitment to putting in the hard hours at Gawthorpe. Troublingly, there was an echo of the Bond years early on when Waddle quickly shelled out unexpectedly large fees on three players who did nothing to improve the quality of the squad. In spending the best part of £700,000 before August was out, Waddle effectively blew his transfer budget for the whole season with barely a ball kicked. Waddle didn’t even speak to me for three months. Training was a joke. Waddle would often say on a Monday, “See you guys on Wednesday.” On match days he’d just say, “Go out and play.” It seemed there was no game plan. Waddle’s season in charge may well have hastened the end of Frank Teasdale’s chairmanship. By the time Waddle and Roeder had left the building, the club was £4 million in debt and losing around £10,000 a week. Having allowed Waddle to splurge all the spare cash, liabilities had risen by over £800,000 during the season. The club had just avoided a disastrous return to the Fourth Division, and the cupboard was bare. Convinced that things could not go on without fresh investment, Clive Holt admitted to Tim that he went behind Teasdale’s back to court Barry Kilby, an option Teasdale wasn’t too keen on because the price of a significant Kilby investment would be the chairmanship and a majority shareholding. Before stepping down, Frank Teasdale and his board made one last decision, and it was one of their better ones. Having seen two young managers struggle with the man-management side of the job, they figured that what they needed was a decent coach who could bring a dose of old-school discipline to proceedings, someone who would most definitely be in charge and brook no nonsense. As an ex-Claret who had just dragged Bury to the second tier of English football and kept them there, Stan Ternent was the obvious candidate, and, for once, everyone saw it. Tim captures perfectly the approach of Stan that made him at once both the ideal character to haul Burnley back to respectability and a very difficult work colleague. Barry Kilby tells Tim that when he arrived to take his seat in the chair, in December 1998, he discovered that Stan had reacted furiously when the board had tried to intervene in footballing matters following his remarkable declaration after the August home defeat to York City that four senior players would not play again for the club, including two of Waddle’s flagship signings. If ever there was a declaration of intent from a manager to a squad, that was it. Ternent proceeded to play some of the kids, and there’s nothing a Burnley fan likes more than to see a Gawthorpe graduate hold his own in the first team, as Matty Heywood and Chris Scott did. From that point onwards, backed by Kilby’s money, Ternent quickly rebuilt Burnley from a club struggling in the third tier to one challenging for promotion to the Premier League. It was a transformation remarkable both in its speed and longevity: between March 1999 and December 2001, covering a span of four campaigns, Ternent’s Burnley lost just 29 out of 128 League games. The Kilby/Ternent partnership had reinvigorated the club to the point where attaining a lucrative place in the Premier League was a possibility, but this vital last stage remained just beyond Stan’s doughty squad. No modern history of Burnley FC can avoid the dreaded phrase ‘ITV Digital’, and for Stan, the financial crisis that engulfed the club upon the collapse of this wretched deal effectively ended any hope he had of taking the club up and of testing himself in the Premier League. The last fee Stan paid was for Robbie Blake, in January 2002. From this point on, the club drastically retrenched in a desperate attempt to cut its costs, and Stan had to make do with free transfers and loans. For all his success at the club, Stan’s long reign as manager was book-ended by two extremely important fights against relegation. The 1998/99 season ended with a decent unbeaten run, but it is instructive that Stan himself regarded his best achievement as avoiding the drop in 2003/04, immediately after which Barry thanked him for his services and released him – a decision which was widely regarded as both harsh on Stan and right for the club. There is little question that Cotterill was dealt a tough hand with the constant demands from the board to reduce playing costs. Every one of his squads was short on numbers and reliant on loan signings – little surprise, then, that Cotterill’s Burnley tended to start well, sometimes extremely well, before fading as star performers were sold and players began to miss games through injury and suspension. Looking back, Cotterill is remarkably diplomatic about this. In his first season in charge, with Burnley in the play-off places at Christmas, the club accepted offers for both Robbie Blake and Richard Chaplow, realising around £3 million in fees, but decimating the team’s attacking verve. It was rare for Cotterill to get the opportunity to splurge. £600,000 was splashed out on Ade Akinbiyi, but more common were free transfers and five-figure fees, which nonetheless brought in some considerable talent, such as John McGreal, Michael Duff and Wade Elliott. In another instance of needs must, Cotterill, probably against his instincts, blooded some youngsters – and not in ideal circumstances either. I remember a game at Watford where teenage forward Kyle Lafferty was deployed at left-back, and had to stay on despite being exhausted. But Lafferty and fellow youth team graduate Chris McCann established themselves under Cotterill when a bigger squad might have frozen them out. As the section on Cotterill proceeds, the financial situation at the club hangs ever more darkly over the narrative, including the sale of Turf Moor and Gawthorpe to Barry’s Longside Properties, and a desperate ‘500 miles’ fund-raising initiative. One consequence was that Burnley could quite legitimately sell themselves as one of the more prominent shop windows in the second tier, so when big money was spent, it was – quite astutely – invested in well-regarded striking talent, with the clear objective of turning a profit. Whatever the rhetoric from the board about “reaching the promised land” this remained the case even if it scuppered a promotion bid, as the £1.75 million sale of Akinbiyi in January 2006 proved. Everyone knows we’ve got the smallest squad and I’m sick and tired of saying it. Tonight we were down to our last 16 players…If we want to stay there or thereabouts, we need to strengthen. It’s clear from reading the chapter on Cotterill that the great tragedy of his managership was that he had run out of credit with the squad just as the financial constraints had started to slightly ease. Barry had succeeded in expanding the number of directors, each of which invested heavily in shares to join the board. In December 2006, they were joined by Brendan Flood, who was certainly not there to merely admire the view from the Bob Lord Stand. At precisely the same moment, Cotterill’s team started a disastrous winless run that would stretch to the start of April and plunge Burnley into a relegation battle. Having boldly spent £1.3 million of his own money to boost Cotterill’s team, Flood looked on incredulously. It was the beginning of the end for Cotterill. The other thing that Tim brings out vividly about this period is the impact of Flood. Although his companies would not survive the end of cheap credit on the world’s financial markets, at this point in time he comes across as someone with an utter conviction in his own judgement and with the money to back it up. Tim reveals that Flood had been warned by a Barnsley director not to put his money into a football club, but he simply ignored the advice and decided instead to have an expensive adventure with his cash. In this sense, there was something almost boyishly gleeful in the manner of Flood’s investment. It’s tempting to wonder whether Barry ever pulled him to one side and told him to calm down. With Cotterill gone, at the instigation of Flood, just 14 games into the 2007/08 season, Flood is at the forefront of recruitment efforts. Once again, he has a left-field hunch that he convinces the rest of the board to go along with. Thus began the brief but intense Turf Moor personality cult of Owen Coyle. We are, by now, at chapter 9 of From Orient to the Emirates, and while most chapters deal with periods of three or four years, this one is simply ‘2008-09’. So much has been said and written about Coyle that I will restrict my observations to how well Tim reconstructs the febrile atmosphere at this point, given the excitement over the possibilities under Coyle together with the ambition of the board to redevelop Turf Moor and the club’s ambition to create some kind of American franchise. These are the months of peak Bren and peak Fletch, a heady concoction you’ll agree, just before the American sub-prime mortgage market goes pop and seizes up the world’s credit markets, nobbling Flood’s property business overnight. Judging from the jaunty prose, Tim has a great deal of fun describing the 2008/09 season on the pitch, and it was indeed one of the most memorable campaigns of recent times, even with the suspicion that it lacked substantive foundations. Michael Duff is quoted as saying they were “the most unprofessional group of footballers you’ve ever seen,” and Clarke Carlisle cheerfully revealed that Coyle was something of an anti-Cotterill, spending no time whatsoever on set plays, and encouraging individual expression. The chapter ends with Coyle’s mid-season departure from the club’s first Premier League campaign, and the lamentations of the players that he left behind. They were clearly at a loss to make sense of Coyle’s actions, and it proved impossible to recreate the atmosphere he fostered, as much as they tried. It probably didn’t help that his replacement was the notoriously prickly Brian Laws. The next chapter is entitled ‘What Goes Down’ – a clue as to what happens next, which is another retrenchment every bit as ruthless as that experienced by Ternent and Cotterill. Tim’s narrative includes regular updates on the finances, and it’s clear that for all the talk about one season’s Premier League cash seeing the club right for seasons thereafter, it proved impossible to keep a cap on the wage bill, which ballooned to over £22 million, way over Flood’s estimate of £16 million. The club had to get that down, so the highest earners had to be jettisoned. In the close season of 2011, Eddie Howe saw his squad dismantled. There was one difference from the downsizing of the post-ITV Digital years. There was still some Premier cash coming in through the parachute payment system, and some of the assets sold realised decent cash: Southampton paid £1.8 million for Danny Fox, for example. This gave Howe a transfer budget, and, in retrospect, his recruitment was impressive: Charlie Austin and Danny Ings came in for a combined fee of around £2 million, whilst the loan deals for Man City defenders Kieran Trippier and Ben Mee were made permanent in the January transfer window at a cost of another £1 million, a transaction thought to be funded by new director John Banaszkiewicz. The £3 million spent for those four players proved excellent and important business. Although the 2011/12 season was one of consolidation after a period of high player turnover, the club lost £4 million during the season and cashed in their star asset in the summer as Jay Rodriguez left for Southampton for £7 million. Howe responded by buying Sam Vokes from Wolves for a mere £500,000 – again, good business in retrospect. Howe’s big buy was Jason Shackell, whose immediate installation as club captain suggested that the manager saw him as a defensive organiser and lynchpin, but the major flaw proved to be a leaky defence. Just 10 games into the 2012/13 season, Burnley had conceded 22 goals and were stuck in the lower half of the table. At this point, Howe upped sticks back to a Bournemouth side struggling at the wrong end of the third tier. The official explanation for Howe’s sudden departure was family circumstances, with both he and his immediate family deeply affected by the sudden loss of their mother. But alongside this, there was also a sense that Howe simply wasn’t the right fit for the club. Tim notes Brian Stock’s comment: “There’s been a good atmosphere since Eddie and Jason left,” and Howe’s restructuring of the youth system has since been widely regarded as a disaster. Finding someone who was, among other things, more at ease with the nature of the club was a priority for joint chairs John Banaszkiewicz and Mike Garlick, and the time they took to interview and re-interview before appointing Sean Dyche has been richly vindicated. It’s worth remembering that the reaction to Dyche’s appointment was underwhelming, perhaps because his reputation at Watford had been forged on making the very most of meagre resources, alongside a readiness to introduce younger players into the first team squad. Although the club could still budget for parachute payments, it seemed fairly evident that the key virtue they saw in Dyche was that he could steadily manage the transition back to operating on organic turnover only. As for Dyche, he set his stall out from the beginning with some of the phrases that we have come to learn and love. Tim quotes his first press conference, and it includes the observation that he had to “add to the defence, not take away the scoring.” To be fair to Dyche, that’s exactly what he did. In the remaining 33 League fixtures of 2012/13, the Clarets conceded just 30 goals – it appeared that he had little problem getting across to the players the ‘framework’ that he wanted them to play within. But the quality of the football did little to inspire much hope for the following campaign, particularly when Dyche lost 28-goal Charlie Austin to a £4 million offer from QPR. I’d like to see some attacking football. I wasn’t sorry when Eddie Howe departed; in fact, I was quite glad to see the back of him. His mantra was that he was trying to build something here, but I couldn’t for the life of me see what it was. Part of Dyche’s problem is that he’s inherited an unbalanced squad with not enough players of real quality. The thinness of the squad was apparent, but in a classic case of forging a spirit that elevates a team above the sum of its parts, Dyche masterminded a brilliant promotion. No matter what he goes on to achieve as Burnley manager (and there is a widespread view now that he may move on soon) Dyche will probably struggle to top what he did in 2014. The story of his first promotion is the last big set-piece in From Orient to the Emirates, and in digging out interviews with players and staff through the season, Tim makes a convincing case that the triumph was founded in pre-season, not just in the fitness levels achieved but also how Dyche set the training up so that teamwork, collaboration and responsibility were the benchmarks of success. I believe our club commands considerable respect. We have endured and yet triumphed over almost suffocating financial adversity. We have had to pull ourselves out of the mire without the assistance of rich benefactors. The respect we now enjoy has been hard-earned. I’m sure Barry is right in his instincts there, but it got me thinking about the sub-title of From Orient to the Emirates. It’s: ‘The Plucky Rise of Burnley FC’, and I was trying to think of another adjective, but I reckon Tim has nailed it. Cynics might suggest erasing the first letter, perhaps pointing to the ‘death or glory’ gamble of the 2009 promotion, or the once-in-a-lifetime alignment of 2013/14 where a tiny squad knitted together, avoided injury and went all the way to a most unlikely promotion. But the story is one of pluck, albeit in the widest sense of the word. It’s really not about staying in the Premier League. It’s about the club still being around, honouring its history, and trying to do the town proud. From Orient to the Emirates makes one thing clear: the thirty years since 1987 have been a real grind. As such, Tim has documented not just the highs and lows, but the interminable seasons of mid-table mediocrity as well, when keeping your faith and hope was a test. That Tim has accounted for these tough years, alongside the glorious ones, in such a readable and entertaining way won’t be of any surprise to those of you who are familiar with his writing. But bringing it altogether in one volume makes you appreciate the journey for what it has been, and as such is an excellent testament to our football club and a real literary treat for any Burnley fan.